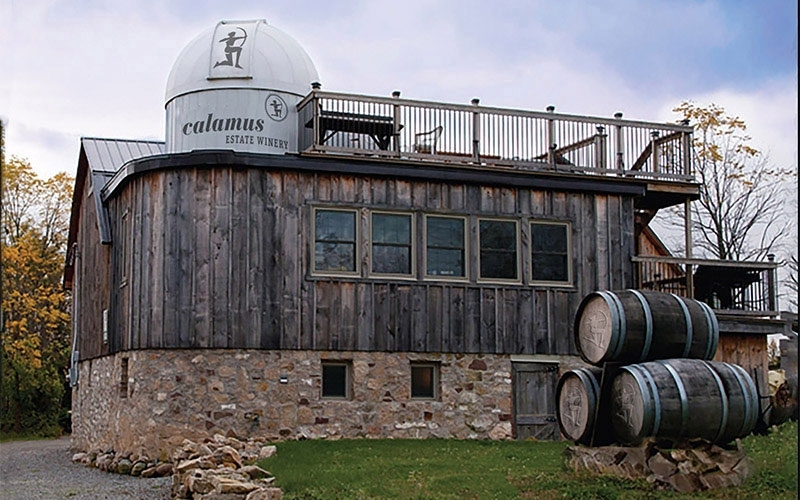 Calamus Estate Winery sits beside Ball’s Falls Conservation area near the scenic town of Jordan, Ontario. Charming and historic 1800's era heritage barns house the production area, tasting room, retail store and loft event room. Many Niagara wineries shoot for the stars but Calamus takes direct aim from their deck-top observatory! Our approach to wine quality has been to aim high and settle higher. To-date Calamus VQA wines (100% Canadian grown and produced) have won well over 100 medals in Canadian and International competitions. One winemaker, Arthur Harder, has been on board from the beginning. Our wines are fun to drink, wallet friendly and rival the best in the world. Husband and wife owners, Derek Saunders and Pat Latin are nearly always on site and our tasting room sales team is passionate about the product and knowledgeable about the industry. "BEAUTIFULLY CRAFTED ARTISANAL WINES, MADE WITH CARE BENEATH THE STARS"